20 cm xxiii, 288 p.,  p. of plates : ill., maps, ports. Reprint. Originally published: London: Michael Joseph, 1981. 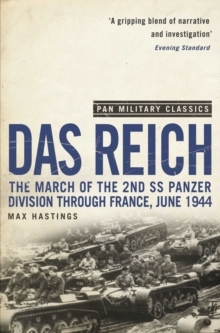 Within days of the D-Day landings, the Das Reich 2nd SS Panzer Division marched north through France to reinforce the front-line defenders of Hitler's Fortress Europe. Veterans of the bloodiest fighting of the Russian Front, 15,000 men with their tanks and artillery, they were hounded for every mile of their march by saboteurs of the Resistance and agents of the Allied Special Forces. Along their route they took reprisals so savage they will live for ever in the chronicles of the most appalling atrocities of war. Max Hastings' Das Reich is a powerful account of their progress and a true military classic.